Bachelor of Computer Applications in Royal Thimphu College as per the course syllabus prescribed by the Royal University of Bhutan demands us to do the real-time project which is of 300 credits and is equivalent to three modules. The IT department of the college in the Fourth semester i.e. when the BCA students are about to get into their final year go to organizations, institutes, agencies, Non-Government Organizations and Corporates to get the projects which will be taken as our project client. In my batch, we are 3 in number and we have nine projects in total. Our clients are Bhutan Power Corporations, Bhutan Telecom, Druk Holding Investments (2 projects), Department of Information and Technology, Royal Thimphu College, Bhutan National Bank, Athang Pvt. Ltd and Bhutan Herbal Bath Pvt. Ltd. We were divided into nine groups for which group comprises of 3-4 members each. In case of my group we have selected to work for our college, Royal Thimphu College. We have learned and observed that the college Student Service Department and applicants are struggling during the admission process. We thought why not we can help the college in our own small ways that we could. My group started the development works in December 2012 and worked whole winter including weekends. Having worked for the live project for the first time of its kind we enjoyed a lot, though we faced some problems. Before starting the project we sat together for almost three to four days and planned our schedule. 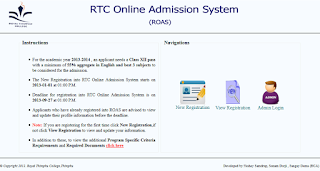 RTC Online Admission System is an online application through which students from different locations can access college information and take admissions. Using this system, time for application process will be reduced and students who are located geographically can fill admissions forms. Cost of traveling for students will be reduced; man power for university will be reduced. It is an automate the system whereby it pre-checks the inclusion of all required material and automatically ranks each student’s application based on a number of criteria. The data used by the system is stored in a database that will be the center of all information held about students and the base for the remainder of the process after the initial application has been made. This enables things to be simplified and considerably quickened, making the jobs of the people involved easier. It supports the current manual process but centralizes it and makes it possible for decisions to be made earlier and easier way. The Project was led by Mr. Somnath Choudhuri as the project guide and Mr. Yeshi Samdrup as the Team Leader. My self and Sangay Dema were the co-developers in this system. 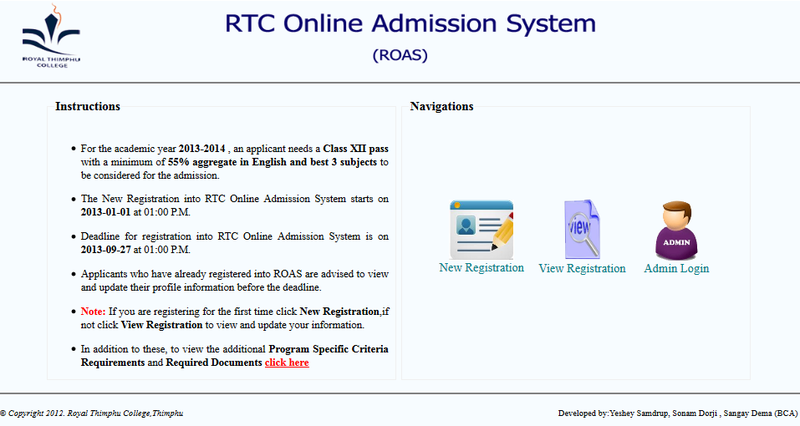 We may be soon hosting it in RTC website for the admission for 2014-2015 cohorts' admission. This Online administration system or Online Project Management system you have developed is really very good. Now a days Online Project Management Software are very useful for every business. It helps to save time so you can make more money. keep sharing such interesting post.